Hull the strawberries and transfer to a food processor or blender along with the jam, lime juice, water, and salt to taste. Purée until smooth. Add more salt, lime juice, or jam to taste, if needed. Transfer mixture to a shallow pan, cover, and freeze until hard, approx. 3 – 4 hrs. Break up the frozen mixture with a fork, then return to food processor or blender and blend until there are no more frozen chunks. Continue to process, scraping down the bowl from time to time, until mixture is smooth and has lightened in color. Return to freezer if needed, or serve straight from the food processor. 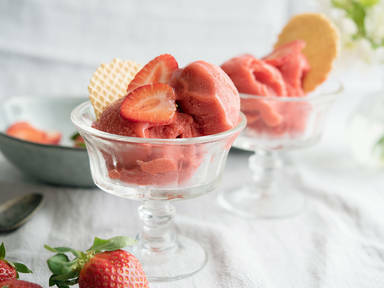 If the sorbet is too hard, let it soften in the fridge for approx. 15 min. Enjoy!